Seemingly out of nowhere, Mixels have taken hold. These small polybags have become popular enough, that a smart investor needs to consider whether adding Mixels to their portfolio makes sense. Series 1 was released in March 2014, and consists of the Infernite (Red), Cragsters (Gray), and Electroid (Yellow) tribes. Series 2 was released in May 2014, and consists of the Frosticons (Blue), the Fang Gang (Orange), and the Flexers (Brown) tribes. Series 3 was released in September 2014, and consists of the Glorp Corp (Green), the Spikels (Tan), and the Wiztastics (Purple) tribes. Series 4 will be released in February 2015, and will consist of two new tribes, Orbitronz (Light Green) and Glowkies (Dark Blue), along with three new Infernites (Red). Each box of Mixels consists of 30 packs. Each box has four complete sets of one tribe, and three complete sets of the other two tribes. This allows for building of three complete sets of Mixels for any particular Series. For Series 1, the Infernites (Red) tribe had four sets. For Series 2, the Forsticons (Blue) tribe had four sets. Series 1 of Mixels started disappearing from store shelves to make room for Series 2 and Series 3 around August/September 2014. Although you could still find them in some stores at RRP, eBay prices saw complete sets of Series 1 going for $65-$70. By the end of September, prices were hitting $85-$90. By the end of October, prices had risen to $105. As of the middle of November, Series 1 sets are consistently selling at $120. With such a consistent and even distribution of characters in each box, you would expect to find sales to be similar for all three tribes. However, that is not the case. Yellow tribe seems to be the most sought after. Yellow tribe commands anywhere between $50-$60. Red tribe, despite being packed four to a case (versus three to a case as the other two tribes), is consistently coming in at $40 per set. Gray tribe comes in around $30 per set. As you might expect, individual Mixels prices reflect the tribe sets. Individual Yellow tribe members, especially 41508 Volectro are the hardest to find, and therefore command a premium on the secondary market. The other Yellow tribe members are also difficult to find, which causes a similar spike in their price, although not as much as Volectro. Prices are around $15-$20 per individual. Red tribe members, despite the four versus three per case, as individuals are similar to the sets. Individual tribe members are going for $10-$15 per individual. Gray tribe members, much like the sets, are easiest to obtain. Most Gray tribe members are available around $10 per individual. Mixels allow for an incredible amount of MOC'ing. LEGO encourages a lot of creativity with the Mixels line. 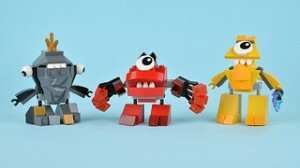 On the Mixels website, LEGO has published instructions on how to MIX, MAX, and MURP a number of different versions of Mixels. Not only can you do that within an individual tribe, but LEGO has shown you how to do it between multiple tribes. Mixel Mega Mix! 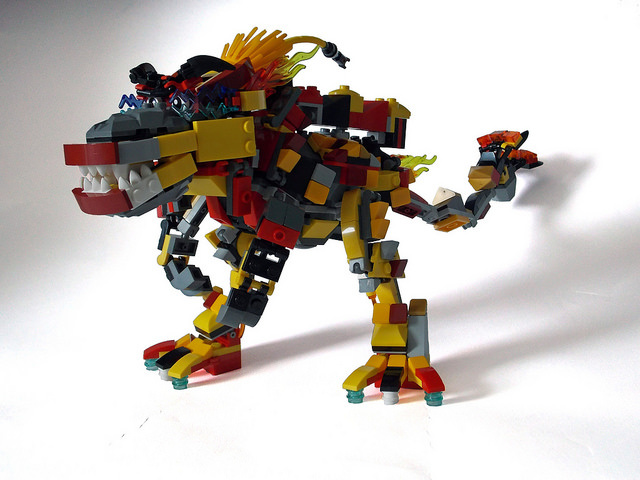 by Andrew Lee on Flickr Mixels have allowed imaginations to run wild. The part/color combinations are a little unique. The combinations are endless, and really encourage the initial design as a starting point, rather than an endpoint. Mixels compare well against other LEGO products. The price per piece is between $.07 and $.10. There are 524 parts in the Series 1 set. At $45, that is about on par with other similarly sized sets. 21108 Ghostbusters Ecto-1 is $49.99 for 508 parts, 4209 Fire Plane is 522 pieces for $59.99 and 76028 Darkseid Invasion, coming in 2015, is 545 pieces at $59.99. The desirability of certain colors appears to be driving the market. Yellow appears to be the most desirable of Series 1, which would explain why the individual sets of Yellow are the hardest to come by. And other there are more Red tribe available than any other color, Red tribe appears to be more desirable than Gray. The same seems to hold true for Series 2 as well. Blue tribe is more available than any other tribe, but appears to be the most desirable of the three tribes. Blue tends to be the most scarce of the three Series 2 tribes. With 3 series coming out per year, past Mixels sets could easily be forgotten. But the collector mentality has seemed to grab hold; consumers want to complete full collections of Mixels. Just like the 3-in-1 Creator Sets, many consumers will want to have multiple sets, to allow them to display the different versions. LEGO encourages this, by including past series in the new series (Infernites in Series 1 and 4). By publishing instructions MIX'ing and MAX'ing multiple tribes, LEGO will continue to help drive the desirability of the older sets. And at the end of the day, these sets just look cool. And combining them just make them look cooler. Series 2 is quickly disappearing from stores. Some outlets, such as Toys R Us and Target still have limited supplies. As supplies become limited, prices should continue to rise. Already, sales on eBay show pricing between $60 and $85 for complete sets. As these disappear from primary sources, you should continue to see prices climb. Series 4, while expected to debut in February 2015, may arrive on shelves as early as late December 2014. At that point, any remaining Series 2 will disappear quickly. As with all LEGO investing, don't wait to acquire product. However, Mixels do allow you some safety with your acquisition methods. As with the CMF line, you have insight to the general availability of the line; you can expect that the line will debut at a certain time, and will begin to disappear around the time the next Series debuts. This provides plenty of opportunity to pick up product on sale when those opportunities presents themselves. Awesome write up from the mixel master himself. I owe you a debt of gratitude--I remember when you first posted the "Which would you rather have" post, an SSD vs a case of Mixels. Mixels weren't really on my radar and I was lucky enough to have a stash of Series 1 near me I could raid and began hoarding. Many guys when they find a great niche in the market like that would keep it to themselves, it was awesome of you to share the knowledge. It made me a lot of money! When I first saw Mixels I honestly thought they were a dud for investment, just for kids and a cheap little monster. But the more I saw them the more I thought they were pretty cool. And the interesting parts generate a lot of interest from people building MOCs. Nice article from the master of mixels. Another reason its a great site / community where everyone helps out and shares there knowledge. I too didn't pay much attention to these until reading posts about them and trying them out for myself. Like many others, I had absolutely no idea how well or badly these little freaks of nature would do. I had hopes of good things but hoping means diddly with what actually transpires so for those of you who were willing to take a chance, I am glad to see how it did go. Actually, I am delightfully surprised with how amazing these kicked off both in the primary and secondary market. While the cartoon is rather crazily bizarre by me, the assortment of pieces in unique colors (many of which are new to that hue) give possibilities to create all sorts of funky designs kids in their formative freeform years whose imagination would simply devour. True there is no collectable minifigure included but with these you get to create your own action figures. From one royal to another, this is one nicely written article by the Grand Poobah of Mixels himself. "May your reign always mix but never nix and cover your mouth when you burp else you'll get a murp." Awesome article! Well worth the read! I've jumped on the ban wagon for mixels after everyone would post that they add a mixel onto an item to get to a certain dollar amount to get a lego freebie or whatever promotion was going on. I didn't understand or know anything about mixels but when I found 4 series 1 figures at my local tru in oct I was hooked lol! I liked raiding the series 2 mixels at lego stores in oct to get the promo and mixels. Just to add to the article the blue series 2 guy flurr seems to be the most popular selling for about 12$. What do you think is the most popular color in series 3? And the most popular series 3 character? Thanks for the kind words. In the last couple of weeks, I've been doing a lot of stocking up on Series 3. Just looking around, I've found that 41524 Mesmo seems to be the hardest one to get ahold of. Is this an indicator that Purple is the most popular? I'm not sure yet. Just looking at one Toys R Us I was at last night, they had far fewer Purple than Green or Gray. But I'm not yet comfortable saying that Purple will be the Yellow or Blue tribe of Series 3. A++ article and perspective! I love the investment side of these sets, but that aside... what a cool and unique theme for Lego to bring on board. My kids love these things. My portfolio, too. Many, many thanks to Alpine for a deeply researched and well-represented perspective on a Series that deserve a serious look. Nice article Alpinemaps! You opened my eyes too. I didn't get to tons of Series 1, but I did make some money off them, for sure. 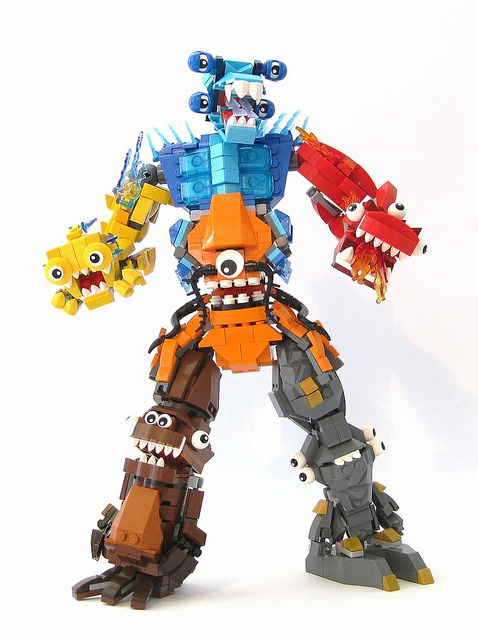 Wonder how long until they do a mixels in a blind bag, and hopefully a chrome set too.